Fortune hunter Patrick O'Brien has left his daughter Kathy and guide Umbopa to trek across the desert in hopes of finding the fabled diamond mines of Solomon. Worried about her father, Kathy persuades hunter Allan Quartermain to lead a party to rescue him. After surviving the desert they are found by natives and brought to their chief, Twala. Umbopa reveals himself to be the true heir to the tribal throne, having been exiled years earlier by Twala and the tribal witch, Gagool. 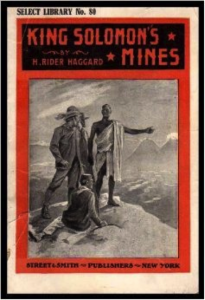 Quartermain's only hope to gain access to the mines and the possible rescue of O'Brien is to try to help Umbopa regain his rightful place as chief. Davies, Philip. “Editorial: King Solomon’s Mines: Birth Of A Legend.” Palestine Exploration Quarterly 145.2 (2013): 87-88. Academic Search Premier. Web. 17 Apr. 2014. Ugor, Paul. “Demonizing The African Other, Humanizing The Self: Hollywood And The Politics Of Post-Imperial Adaptations.” Atenea 26.2 (2006): 131-150. MLA International Bibliography. Web. 17 Apr. 2014.